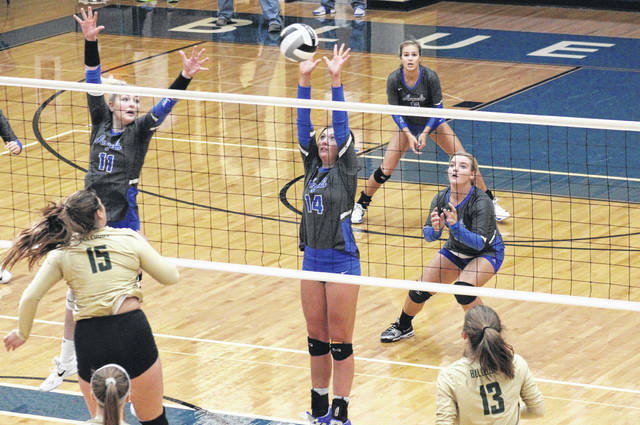 Gallia Academy junior Hunter Copley (14) blocks an AHS spike attempt in front of teammates Ashton Webb (11), Alex Barnes (back) and Ryelee Sipple (right), during the Blue Angels’ 3-1 victory in the sectional final on Saturday in Centenary, Ohio. Gallia Academy sophomore Peri Martin (right) spikes the ball past an Athens defender during the Blue Angels’ 3-1 win in Saturday’s Divsion II sectional final in Centenary, Ohio. CENTENARY, Ohio — The Blue Angels must have a thing for three-peats. Just 12 days after clinching their third Ohio Valley Conference title in a row, the second-seeded Gallia Academy volleyball team won its third consecutive Division II sectional championship, defeating third-seeded Athens by a 3-1 tally on Saturday afternoon in Gallia County and preventing the Lady Bulldogs from making a seventh straight trip to districts. The Blue Angels (23-1) never trailed in the opening game, boasting a 54.5 side-out percentage and 18 kills on their way to a 25-21 win. After a trio of early lead changes in the second game, Athens (18-6) established a five-point, 18-13 lead. The Blue Angels cut the deficit back to one point, but the Lady Bulldogs claimed the next five. Athens still led by six points and was in a game-point situation, when the hosts began to fight back again. Gallia Academy scored four straight points, but AHS finally pulled through on its fifth game-point try, tying the match at 1-all with a 25-22 win. The Lady Bulldogs led early in the third game, but GAHS fought back to take the edge at 9-8. Athens tied the game three times before regaining the advantage at 13-12. Gallia Academy tied the game at 15, 16, 19 and 20 before finally regaining the edge at 21-20. Athens tied Game 3 for the 12th and final time at 22, but the Blue Angels claimed the next three points and moved ahead 2-1 in the match. Gallia Academy took the lead at 3-2 in the fourth game and then stretched the advantage to eight points at 11-3. However, Athens reeled off nine straight points and was back in front at 12-11. The teams fought through ties at 12, 14 and 16 before GAHS went on a 9-2 run, sealing the game by a 25-18 final and the match by a 3-1 tally. For the match, Gallia Academy had a side-out percentage of 48.8, while AHS finished with a side-out percentage of 43.2. The Blue Angels finished with 67 team digs, 28 hitting errors and seven serving errors. The GAHS serving percentage was 92.6 for the match. The Blue Angel service attack was led by Taylor Burnette with 14 points, including five aces. Ashton Webb and Peri Martin had 10 points apiece, including five and two aces respectively. Alex Barnes and Ryelee Sipple both added seven points, including an ace by Barnes, while Hunter Copley finished with six points and one ace in the win. Webb led the way at the net with 27 kills and two blocks, followed by Barnes with 15 kills and one block. Copley and Martin each had three kills and one block for the victors, with Martin earning a team-best 40 assists. 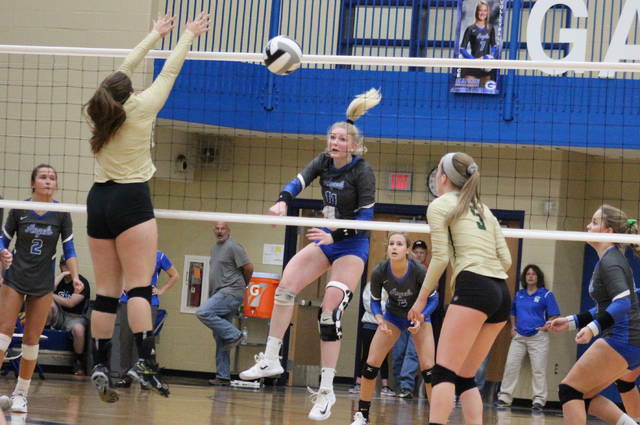 Aubrey Unroe contributed two kills and one block to the Blue Angel cause, while Webb led the defense with 16 digs. Serena Smith led the Lady Bulldogs with 14 service points, including eight in the final game, and two aces. Sierra Smith and Gabby Carey each had eight points and two aces for the guests, while Sydney Rutter chipped in with six points. Baelyn Carey and Emma Hauschild marked three points apiece in the setback, while Sara Webb earned one service point. Gabby Carey led the guests net attack with nine kills, followed by Rutter with six kills and three blocks. Ava Myers and Sierra Smith each had three kills, with Myers posting a team-best four blocks and Smith earning a team-high 24 assists. Serena Smith finished with two kills and a match-best 23 digs for the Green and Gold. While Athens will miss out on the district tournament for the first time since 2010, the Lady Bulldogs did win the Tri-Valley Conference Ohio Division title this fall, going unbeaten in the seven-team league. 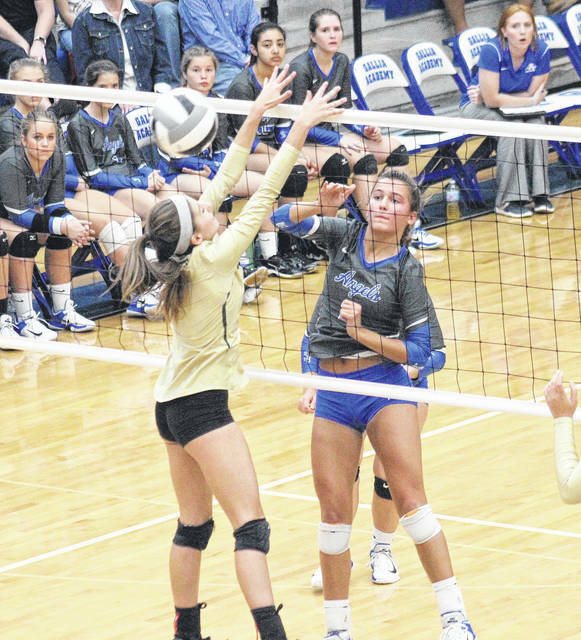 Gallia Academy will now have a chance to avenge its only setback of the season, as the Blue Angles face top-seeded Logan Elm in Wednesday’s district semifinal at Southeastern High School. The Lady Braves eliminated GAHS from the 2016 postseason, in the district final. 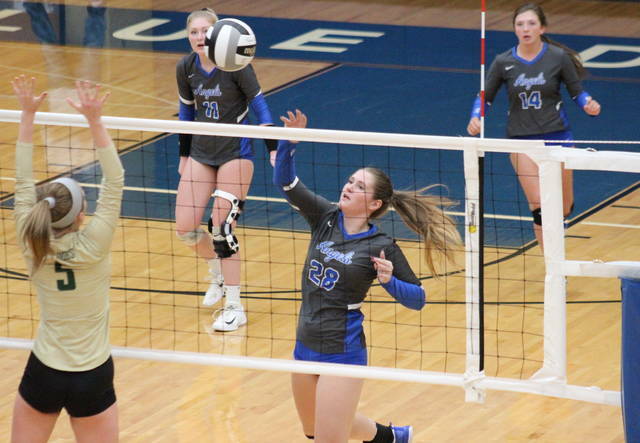 The Lady Braves claimed a 2-0 win over the Blue Angels as part of a tri-match on Sept. 23 at GAHS, in their only meeting this regular season.